Before talking about this section, please keep in mind that the so called drinking water guidelines and their respective violation guidelines are not the same worldwide. The ones which apply in Canada, might not be applicable in other countries in this world or might have a different status (health-related versus aesthetic objective). And there are numerous reasons, why we personally do not agree with many of the established guide lines – let alone the missing ones (as far as we are concerned). But the idea of having excellent and healthy drinking water should be appealing to any home owner. The question, which needs to be raised, is whether an additional segment for drinking water purposes only, makes sense to be implemented into an overall water treatment sequence. This would be linked to personal circumstances. It might be easy to see that the objectives of a family with young children might be different from the objectives of a household with older kids and/or no kids at all. Look at it this way: Whether you flush your toilet with water, which shows high levels of arsenic or not – who cares? But whether you ingest that water or not, should make all the difference in the world to you personally and consequently be taken into account. Makes sense? Of course drinking water quality can be achieved throughout an entire house – again, largely depending on the raw water conditions anyway – but often times so called point-of-use-systems, might be the most appropriate and often times more economical way to go. Deionization units, Reverse Osmosis systems, electric ion exchange and a few more are all available in today’s market for particular objectives and goals. They all do have their rightful place but even with those units, choosing the correct one and then apply customization to meet our customers’ objectives are crucial considerations. 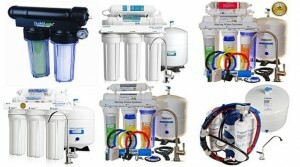 For now we would like to spend a few sentences on so called Reverse Osmosis systems. With proven technology and a high level of customizable features, those units can be very beneficial, once the correct pre-treatment sequence is in place. Comparing RO-Systems can turn out to be quite the challenge for a consumer. Why can I get one system for $400 and another one costs over $3,500. We are not implying that inexpensive means bad but usually higher grade models just have better systems, better filters, better membranes and better warranties. What exactly does 2-stage, 3-stage, 4-stage, 5-stage – RO mean? 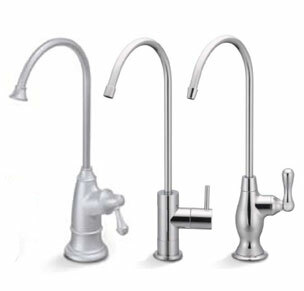 Is one dedicated drinking water faucet sufficient or would you prefer having multiple outlets in the house? Is then a booster pump required? Do I need a larger holding tank for that purpose? Would I like to purchase an upgraded faucet, matching the other fixtures in my house? And what about other components along the lines of “peace of mind”? What is the difference between a certified and a non-certified unit? Is it worth the difference in price? And again we need to point out that each device has its limitations. Often times people are under the impression that a single faucet reverse osmosis application is a substitute for other whole home devices – please do not run into that trap! The better the (necessary) pre-treatment system, the better the RO can do its job and provide what it should – excellent drinking water quality. For well and municipal water supplies, this is certainly one of the best choices to make – if the “rest” is diligently taken care of.